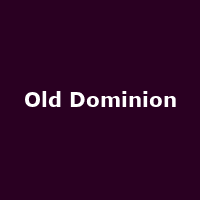 Old Dominion are an American alt-country band from Nashville, formed in 2007. The band features Matthew Ramsey - vocals, Trevor Rosen - guitar/ keys, Whit Sellers - drums, Geoff Sprung - bass and Brad Tursi - guitar. They released their debut album, "Meat and Candy" in 2015, plus 2017's: "Happy Endings".